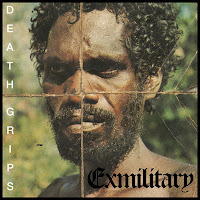 Call me out of touch, but I just heard Death Grips for the first time. I won't try and describe it, you should just listen, if you haven't already. The album, 'Exmilitary' is available as a free download at thirdworlds - or you can listen to a stream from Soundcloud after the page jump.. The whole album can be downloaded in a re-mixable form. This page is getting twice as many hits as any other page on the site.